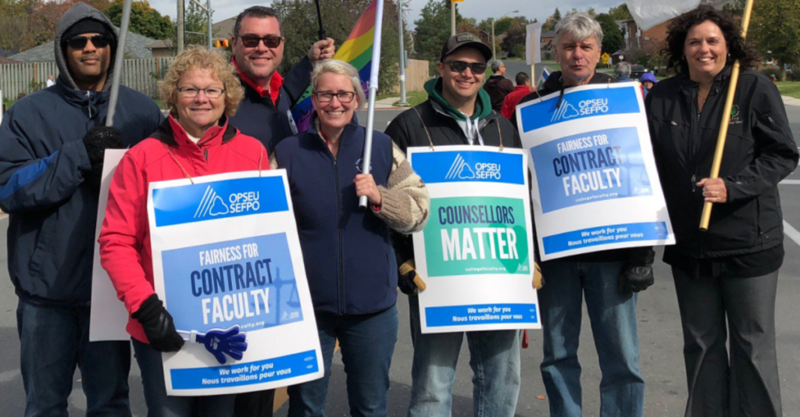 We spent five weeks on the picket line–100 hours–during the longest strike in the 50 year history of Ontario community colleges. I have wanted to be a teacher for as long as I can remember. For many educators, the calling to teach is strong. It is rewarding to help students unlock a concept in a lesson and to play a role in them seeing the world a little differently. When I first started teaching as an adjunct faculty member in the Ontario college system, most of the benefits that I derived from teaching were these magical and intangible rewards because, simply put, the job did not pay a living wage. As a family, we decided that we could make it work temporarily and adjusted our finances accordingly. I recognize our privilege. Had we not been able to do this, I may have not continued to accept teaching work or, like many adjunct faculty, would have worked multiple precarious jobs to make ends meet. For two years, I continued to teach on a part-time basis. This meant expressing interest in teaching every four months as a new semester began, desperately hoping that the courses I wanted to teach would be offered to me. Sometimes it meant picking up a new course to teach, often at the very last minute, days before it was to start. It could also mean not teaching at all for a semester. The precarious nature of the work became untenable to me. It was exhausting. The stresses of not knowing what or if I would be teaching semester to semester started to take away from the joys that I experienced in the classroom. Fortunately, a full-time position was posted in my school and I was named the successful candidate. I often wonder where I would be today, professionally, if the stars had not so aligned. I am also keenly aware that most faculty navigating the waters of adjunct work in the Ontario community college system are not as fortunate to have a job opportunity come up so quickly after their part-time tenure began. Despite the fact that there is no shortage of teaching work in the college system, most of us are employed on a part-time basis and wait several years before even having the chance to compete for a full-time position. Changing this was one of my primary motivations for walking the picket this past fall. When educators are not treated with dignity in their work, we all suffer. The idea of faculty working conditions being student learning conditions – a theme of numerous adjunct faculty campaigns – is true to the lived experiences of many. Anecdotally, I have heard countless stories of part-time faculty members hanging on, semester by semester, in the hopes of landing that coveted full-time job. For a fraction of the pay, part-time faculty can have twice as many students in their classes than their full-time counterparts because class size is not factored into their workload. The plight of part-time faculty involves so much hidden work beyond classroom teaching – preparing for classes, evaluating student work, attending meetings and providing out of-class-assistance. To be expected to do this work, without any real assurance of employment beyond the four month semester, is quite unfair: to students, faculty and the college system as a whole. This, I think, is one reason faculty’s collective support of the strike was so strong. Together, Ontario college faculty walked the picket line for five weeks. Spending hours a day alongside colleagues from across the campus provided opportunities for great learning. At a large college like mine, colleagues who were familiar faces in the hallway became people with whom I engaged in meaningful conversation about a variety of issues important to us all. We talked about how dedicated we were to our students and how the current system was failing us. We talked about the working conditions in our respective areas, which made us able to identify inequities across the organisation. We empowered each other to stand up for our collective rights and shared tools to do that. However, most notable to me during the nearly one hundred hours of picketing was the empowerment of our part-time colleagues. Precarious work creates a climate for the worker that makes it very difficult to challenge an employer on working conditions. If a worker is made to feel insecure about the work itself, they will, understandably, often remain silent about the terms of that work. Further, part-time workers are often not even aware of the rights that they do have. The strike changed that. Conversation on the picket line provided an opportunity to learn more about their existing workplace rights under the collective agreement – like sick days, health benefits and salary placement – and empowered many after the strike to raise their hands to enforce these rights, without fear of reprisal, knowing that their union was with them. As the strike dragged on, our solidarity grew stronger. With a forced final offer vote tabled by the College Employer Council during the fourth week, we certainly needed to be united. After having already been on the picket line for so long, 86% of the membership who voted rejected an offer that was largely perceived by the membership as punitive rather than conciliatory. The employer’s offer contained significant concessions in areas like staffing and workload that we had worked hard to achieve during previous rounds of bargaining and needed to protect. But the offer did nothing to respond to the key changes we sought to improve the college system and we told the colleges so with a resounding “no”. Like many, I was still elated at the 86% rejection vote to the employer’s unpalatable offer. The “no” vote sent such a strong message of solidarity. However, there was also a sense of disappointment with the way the strike ended, and the first day back to work post-strike was more difficult than I expected. Being legislated back days after the faculty’s rejection vote felt undemocratic. Also, some of the strike momentum was curtailed as the focus needed to quickly shift back to our work responsibilities. Until that point, we had remained optimistic and hopeful that the strike would end through an agreement at the bargaining table – where it ought to have. Arbitrator Kaplan’s award brought some closure and settled some of the dust that still remained after we were legislated back to work. Among other things, the award provided a clear return to work protocol, strengthened job security for certain part-time faculty members and referred some important issues like collegial governance, college funding, and precarious work to a provincial task force where faculty input will continue to be heard and upon which recommendations will be made. These are net gains for the membership and move us incrementally forward. We are living in an important time of change in the Ontario college system. The passage of Ontario’s Fair Workplaces, Better Jobs Act provides another avenue for workers in Ontario, including college faculty to achieve equity in their workplaces. This law mandates us to have conversations about achieving equal pay. Arbitrator Kaplan’s award also ordered the parties to discuss how this new law will affect the rights of unionized part-time faculty. This province-wide strike achieved many results, including shining a light on the harms of precarious work inside the college system and beyond. Before working in education, I had experience with strikes from a technical and advisory perspective, but that is a very different experience than that of being a front line striking worker. This was my first strike on this side of a picket line and like many others, I walked the picket line for my friends and colleagues who did not have a voice in the workplace and for my children who I hope will inherit a quality college system in Ontario. Postscript: On his first day in office, Conservative Premier Doug Ford announced the termination of the Task Force, which OPSEU had agreed to refer key issues including job security, part time work and contract work to as part of the arbitration settlement. On September 5, 2018, OPSEU took the province to court over this decision, arguing that it “substantially interferes” with the union’s right to bargain collectively. In addition, on August 31, 2018, the Ontario Chamber of Commerce called on the provincial government to repeal Bill 148, the Fair Workplaces, Better Jobs Act. Annette Carla Bouzi is a professor in the Legal Studies programs at Algonquin College. 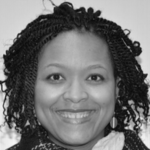 She is a union steward with local 415 of the Ontario Public Service Employees Union (OPSEU) and served as a picket captain during the five-week province-wide college faculty strike in the fall of 2017. The views expressed in this piece are her own.